Andrew, a good friend and also our real estate agent, says the moment he knew we were going to buy our house was when Patrick saw the deck and when I saw the pantry. He is right – it was love at first sight. 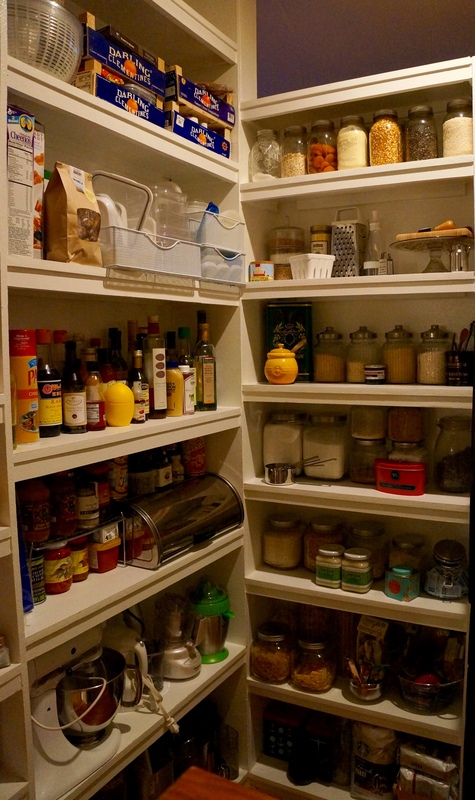 It didn’t hurt that the kitchen it was attached to was also beautiful but after living in tiny cramped apartments with galley kitchens for years the thought of an honest to goodness pantry stopped my heart cold. Even before we moved in I was already at Home Goods buying clear glass containers with images of perfectly coordinated dried goods dancing in my head. The girl who has been reading Martha Stewart magazine since she was in elementary school designed and redesigned what these magical shelves would look like. The reality is a bit less adorable and more practical – though I did get me a lot of those glass containers. A pantry is meant to be used and cannot just hold artisanal olive oils and dried apricots (for color of course) but also has to house the industrial jar of Skippy and packets of Equal. One must be realistic about your family, lifestyle and the kind of cooking you do as well as space constraints. I have the luxury of buying random jars and bottles that catch my eye at ethnic markets without the first clue of what to use them in because I have the space. If you don’t be choosy and just keep on hand the necessities. Think about how you eat – do you do a lot of whole grains? 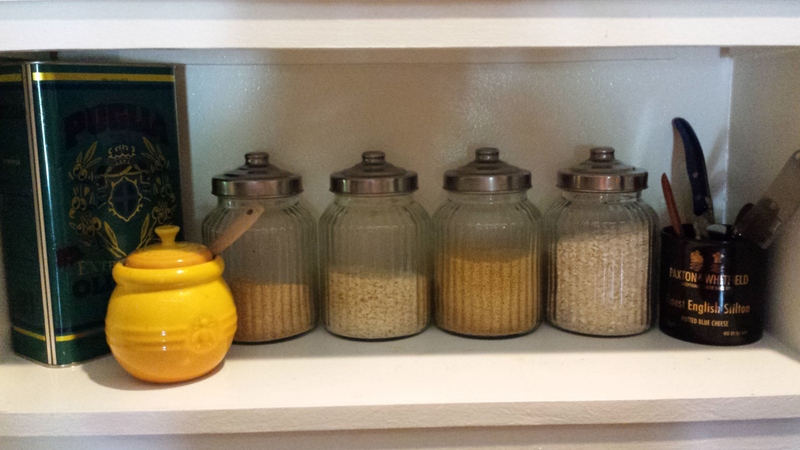 Then it makes sense to buy wheat berries in bulk and keep them in a large refillable container. Are you a baker? Then it’s not unreasonable to have 3 or 4 types of flours in hand to bake with (and yes you can tell your spouse I said so). 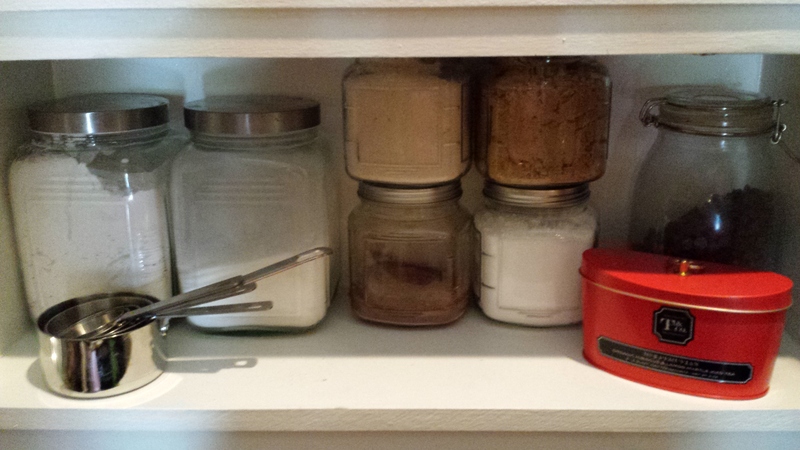 No matter what size your pantry is (and let’s be honest for most people its half of one cabinet in your kitchen) you should arm yourself with key ingredients so that you can easily pick up one or two things at the store and be able to create a whole meal off of what you already have on hand. This makes life easier at the grocery store and for those times where you get really stuck – sick kid, snow storm, Scandal marathon that you don’t want to leave the house for – and just want to make something easily. Here are some suggested lists of what would be helpful to have on hand. Remember – this is all personal so don’t go out and buy things willy nilly, use this as a guide to think about what you already have and what you could probably do without or what you could augment your existing stock. Once you start cooking a ton or stubble across the dream pantry then you can buy all the pomegranate molasses and rice flour to your hearts content. olive oil for cooking and olive oil for finishing – a high quality olive oil will get ruined when cooked with so just use the good (i.e. expensive) stuff for dressings etc. I get amazing quality stuff imported straight from Italy at A. Litteri in D.C.
maple syrup – I am lucky enough to get incredible maple syrup made by a dear family friend Beverly at her sugar farm Erabliere De Winter in Canada. Just make sure to get high quality sttuff and please no fakes! Alex, where do the spice containers come from? Virtually perfect! Excellent…..North Shore Mall, here I come! Love that maple syrup! Substitute maple syrup for the corn syrup in pecan pie. Out of this world! Oh and also would add canned tomatoes and tomato paste to pantry staples. 73 slices LOL. Ok I feel less bad that, of all the things in our house, the heaviest box contained just spices (and still didn’t hold them all!!!). Also re: spices, I like to grow the 5-6 that I use most often (basil, oregano, Rosemary, cilantro, dill, chives, etc) so that for about 3 months out of the year I use exclusively fresh. Then I dry enough to use until the following summer. However now Dave is promising to build me a greenhouse so I may need to rethink this strategy! haha the new solarium isnt enough?? 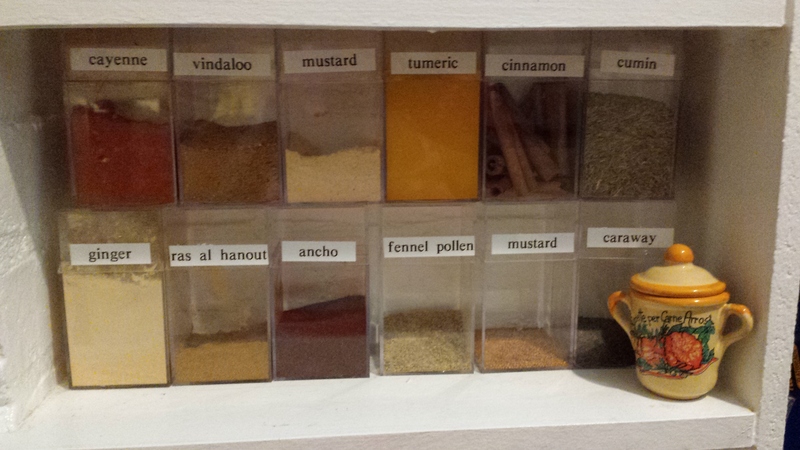 Yes growing herbs is definitely key – of the 73 spices I only have 1 dried herb and thats oregano. Cornstarch is a good staple to have in your pantry for bakers. Seems like almost every recipe I come across includes it in some way and so I FINALLY bought some. Cocoa powder is also important for some of those chocolate cake recipes.